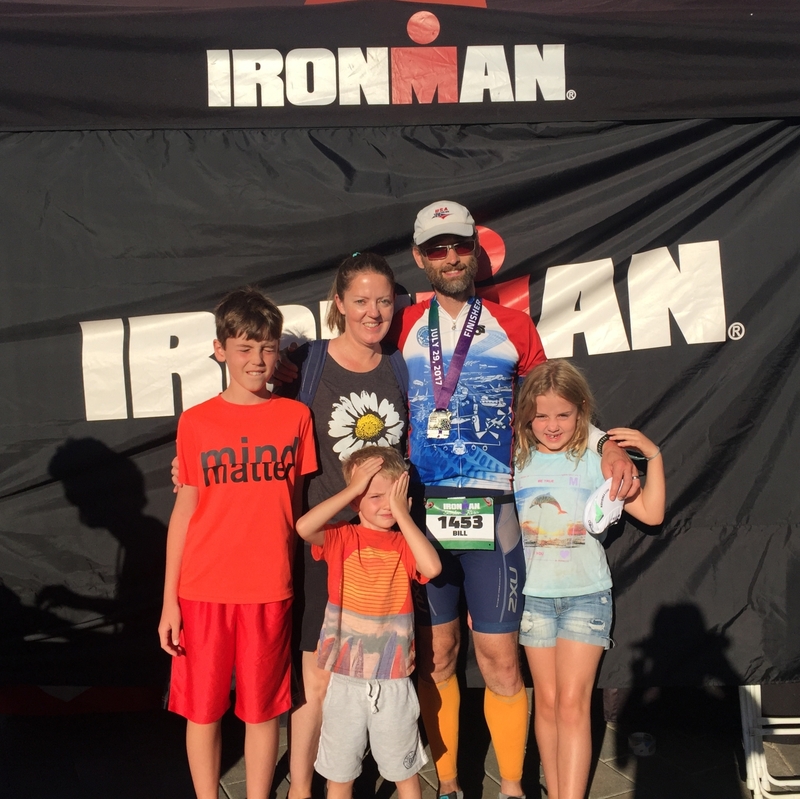 Ironman Santa Rosa is in the books. It's quite a production to work the logistics for these races. I'm grateful Kelsey let me have the indulgence. My time was 12:17:16 overall, with 1:30:10 for the swim, 5:59:41 for the bike, 4:25:58 for the run, and the rest for transitions. I was the 483rd finisher among 1913 starters, about a quarter of the way from the top in the rankings, which I feel good about. Here's how it all went down. The night before the race instead of sleeping at the hotel with my family and a room full of distractions, I managed to get a quiet room in the home of local friends Paul and Kari Jones. I spent an hour chatting with their family in the evening, drifted to sleep before 10, and woke up at 3:30 a bit before my alarm. Paul left a supportive note on the front door for me. I brought the car back to the hotel so Kelsey would have it as she entertained the kids during the race, and I picked up my gear. But I made a flawed last-minute decision: leave my wetsuit behind. The rules allow wetsuits in water up to 76.1 degrees. The day before they announced the water was 76.4 degrees. 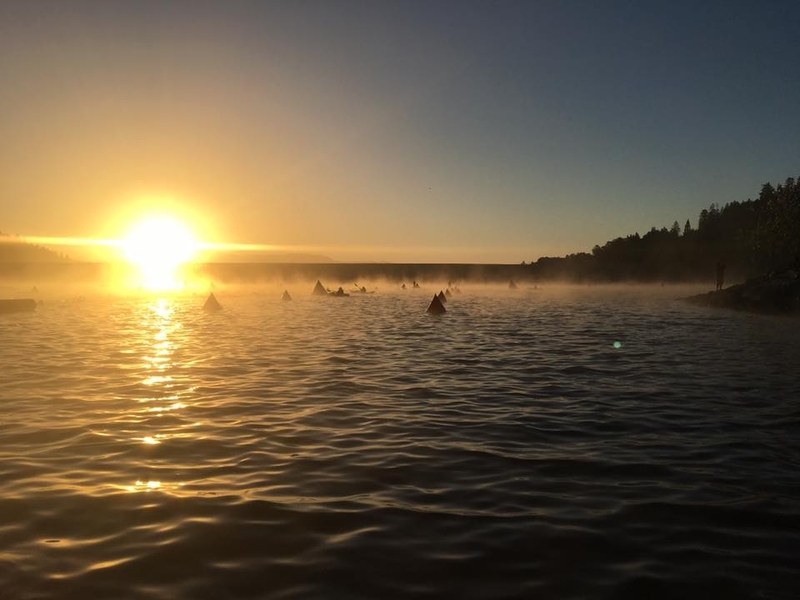 Since the water generally gets warmer each day through the summer, I figured there was no way wetsuits would be allowed, and why bother using scarce space in my bag to haul mine around? I headed for the shuttles that would take us to the swim start. They left in the hour of 4am from downtown Santa Rosa. The word on the bus was that the water temperature had been called at 76.1 degrees, so wetsuits would be legal. I was skeptical of the rumor. But an hour later once we got dropped at Lake Sonoma for the swim, the fact was clear. It was a wetsuit race. Either the temperature reading was done differently from the day before, or the number was fudged. So nearly everyone at the lake was in their speed-enhancing wetsuit. We lined up according to expected finish times, with the fastest swimmers in front so we would be less likely to be climbing over each other in the water. I jumped in around the 1h30m sign. As I approached the water, announcer Mike Reilly commented about me, "No wetsuit, no shave!" True enough. The swim was a pleasure, despite my relatively bad performance (1157 out of 1913 overall for 40th percentile). The venue was as fine as I could have hoped for. Lake Sonoma with steam rising toward the angled light of sunrise was gorgeous. The water was clean, and its temperature perfect. My 1:30:10 time hit my target to the minute. I had worried based on bad training swims that I might actually get pulled from the course without finishing by the 2:20 limit. That obviously wasn't a legitimate concern. But more threatening was the likelihood that I would have stomach pain. Frequently after swims exceeding about 45 minutes, my stomach cramps in a debilitating way that leaves me in a fetal position for a few hours and seemingly unable to eat. Pain is an inconvenience, but nutrition is essential in a race. Anticipating that I might not be able to eat afterward, I downed 100 calories of Gu while walking into the water. And after the first of two laps when we exited the water to cross a timing mat, I downed another Gu that I had carried in a pocket. And arriving at transition, I drank a 220 calorie Ensure. So I was 420 calories in before I had a chance to get to the crucial post-swim time when the pain often arrives. But this day it never did. Once I hit the run, I felt giddy. Even before the start of the race, I knew that running was all I wanted to do, and I was questioning why I even signed up for a race that would require most of my time be spent doing something else. I was pleased with my performance, which gave me position 395 out of 1913 for 21st percentile. I held my heart rate around my target of 160 for the first two hours (and I hit the half marathon mark at 2:02:28 with a 9:22 pace), but then the third hour my heart rate sagged to around 150 which coincided with slower running. Around the start of the fourth hour and at the 20 mile mark, my body crashed. I got delirious, decided to walk for half a mile, could hardly keep my eyes open, and was weaving a bit (so much so that a couple times people checked to see if I was okay). That fourth hour my heart rate averaged 130. I picked up in the final fifteen minutes or so, returning to about 150. I'm sure the hours of the day had taken their toll, but I think nutrition was a factor too, and probably my only mistake other than leaving my wetsuit. I didn't have a plan, and I couldn't keep track of calories on this segment. I hit every aid station, alternating between drinking water and Gatorade and grabbing random pieces of fruit, then toward the end mixing in Red Bull and Coke. But I had no idea how many calories were in two inches of this, or an inch and a half of that. I drank a 220 calorie bottle of Ensure at transition when the run started, and I carried another bottle of the stuff to the third mile marker where I stashed it to be fortuitously retrieved just after mile 20. I also grabbed a bottle from my special needs bag about mile 17. A surprise from the run was that I didn't manage to have much conversation with other runners, as my speed rarely coincided with an adjacent person for more even as long as a minute. I spoke briefly with a speed-walking woman who happened to work for Brooks and seemed somewhat stunned to see me wearing antique Brooks Launch shoes, released in 2012. Kelsey and the kids came to the course to watch for a bit, and used the nicely done athlete tracker to anticipate where they would find me. On my first pass, I high fived them all, and then perhaps 15 minutes later after a turnaround came back to give them all hugs and love. They were in the finish chute too, cheering like mad, but with voices drowned out by the rest of the crowd, so I didn't wind up seeing them until I curved around the finish line with a grin on my face. I brought my oldest two kids back to the finish area for the final 45 minutes of cheering in the stragglers. I am most impressed by the fastest finishers who are the top athletes and by the slowest finishers who are doing something far beyond their normal abilities. The stand-out finishers were a woman who crossed with about five minutes to spare as her brother went absolutely insane on the side of the finish chute cheering for her, and then the last person to make it in time. We watched that person appear perhaps 100 yards in the distance as the clock showed one minute remaining. Would they be able to make it before the clock rolled over to the 17 hour limit? Indeed, with not even ten seconds to spare. I was glad my kids could feel this excitement, and I hope the inspiration it brought them will contribute to them having a life of athleticism. Perhaps I'll come back in another five years to race another one of these. But a big feeling from the day was that my interest in long races overall is waning. I've become more interested in the social prospects of endurance biking and running than in the rankings that come from racing hard -- and alone. I can imagine though that I won't be entirely satisfied with my performance at any Ironman, and that will always make the next race enticing. I wonder whether I would manage to sign up for long races with friends with the plan to stay together for the entire event. I have the Canyon de Chelly Ultra on my calendar for October, along with a couple friends. I think I would enjoy it more if I hung with one or even both of them for the duration of that race, but it's so tempting to push for one's best official result. Races lose their novelty. Friends never do. And it's for my friends who took an interest in my race that I wrote this report. Thanks to each of you! 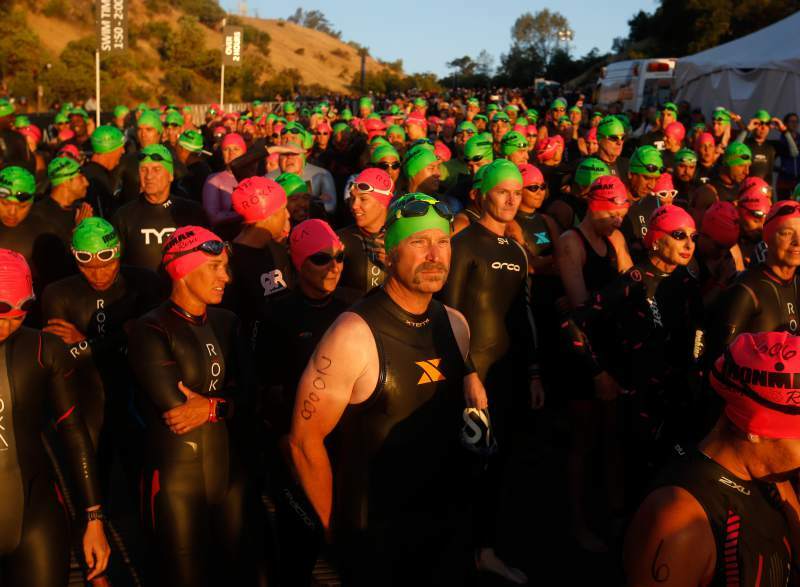 Continue reading Ironman Santa Rosa. This page is a archive of recent entries in the Personal category. Off Topic Tech is the previous category. Projects is the next category.